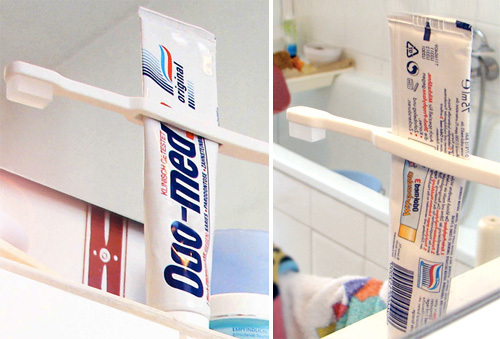 Tube Squeezing Toothbrush Seems Pretty Obvious | OhGizmo! What’s most surprising about Catherine Werdel’s tube squeezing toothbrush design isn’t that it took so long for someone to come up with such a simple solution, but the fact that it still hasn’t been made a reality. Well, I guess it’s not that surprising. The two largest toothbrush manufacturers here in North America, Colgate & Oral-B (Crest), both also make toothpaste. So helping consumers get every last drop out of a tube is only going to hinder their sales. Clearly a conspiracy. So until some third-party brush maker steps in to shake up the industry, you’re probably better off just taking a router to your toothbrush and cutting your own groove in it. I see a fundamental problem with this device. If you’re using your toothbrush to squeeze the tube, you need another toothbrush to squeeze the toothpaste ON to! This is not a problem for the people making toothbrushes, though! @AntonyShepherd:disqus My thoughts exactly. What do you squeeze the toothpaste onto? if you cant squeeze the toothpaste onto this toothbrush then whats the point? just buy regular toothpaste clamp that doesn’t happen to look like a toothbrush. see pic of my patented toothbrush that slit is at bottom, thetefore, able to reposition it on and off at any point, and also detachable! patent # 6,749,088…..I need a thrid party to produce because toothbrush makers also produce toothpaste and they are not into saving you anything. Clearly the picture shows that you cap the toothpaste, squeeze it down to the cap, then uncap and glurge it onto the toothbrush.